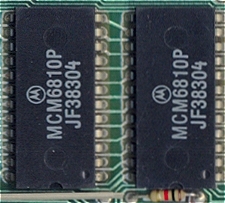 These are the two 128 byte RAM chips. They are also known as Scratch-pad RAM. Together they make up 16-bit, 256 bytes of RAM for the CPU. In fact this is the only CPU RAM available.